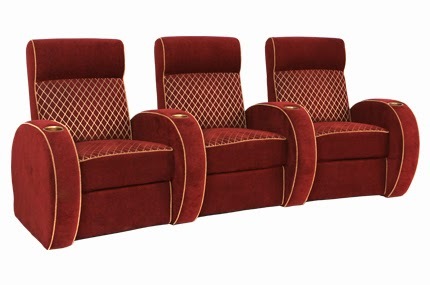 Seatcraft is excited to announce the launch of its Majestic line of home theater seats, a new premium line that can be custom-built to exact individual specifications. 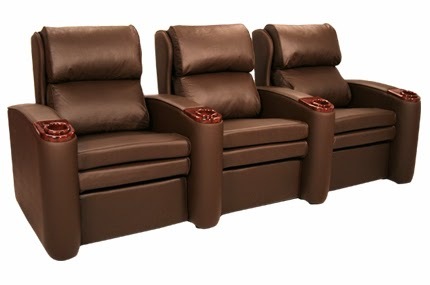 These theater seats are crafted right in the USA from the finest materials and come with a dazzling array of features, options, and upgrades that will transform the way you think about what is possible in a luxury home theater setting! The Majestic series is built to the highest standards, from a rich domestic wood frame that is strengthened by a solid steel base. The two materials combine to ensure a sturdy, highly durable sense of support. A layer of memory foam is then added, which will gently conform to your body's natural contours and then conveniently return to its original shape after use. This foam coating (provides) a firm yet cradling effect that is abetted by an additional layer of cool gel. Cool gel beads help to disperse body heat, keeping the seat at an even temperature even after hours of extended use. The temperature control also results in less outer wear, enhancing durability. Each seat is topped by an Omega power recline mechanism from Leggit-Platt, for a beautifully smooth, safe ride that is also built to last. Picking a seat from the 15 models currently available can be daunting, as each has its own unique charm. 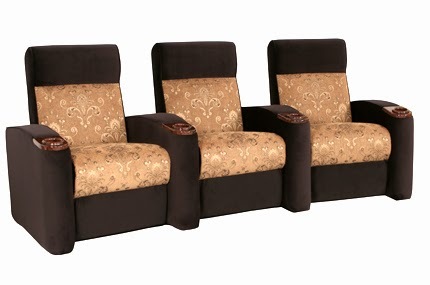 Seats like the Belmont, Century, and Normandy feature streamlined, contemporary designs in a single tone, for a look that will instantly blend into any theater decor. 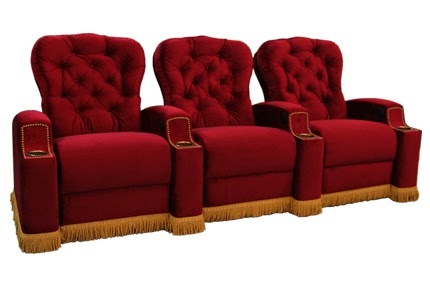 Those looking for a more regal retro style will do well with the Monarch and Regis, which feature exquisitely tufted seat backs and high, plush seat cushions. The Drake combines antique and modern sensibilities, while the Empire boasts a futuristic design of interlocking geometric lines. For a more exotic option, the Mandalay, Odessa, and Rapture chairs feature unique two-tone designs that will instantly capture the eye. Or, try the Pharaoh with its gracefully curved armrests and sharp accent piping. Once you've chosen, the real fun begins as you can now custom design the seat from a wide array of material and color options. Choose from fabric, bonded leather, and four premium grades of top-grain leather, each with its own advantages. Fabric alone offers a kaleidoscopic array of texture, color, and pattern choices, while leather of course is prized among home theater owners for its luxury ambience. In addition, choose from over a hundred different color options, ranging from butternut to passion suede charcoal, sandalwood, fuchsia, and beyond! With so many materials and colors at hand, you are sure to find the combination that will suit your precise taste requirements. In addition, the Majestic line comes with a series of state-of-the-art options and upgrades that will add additional utility and excitement to your seat. Standard upgrades include essential accessories like wine glass caddies, tablet holders, cigar hosts, neck pillows, and reading lights. Whether you are planning a romantic evening in with a loved one, a gathering of friends, or the ability to plug the power of the internet into your screen, these accessories are the perfect fit. A pro buttshaker option will bring the sounds of the cinema right to the core of your seat, or you can choose a USB port to add to the power recline switch, for the convenient charging of cell phones or laptops. Several seats offer the option of a tray table for the placement of food or laptops within arm's reach. Meanwhile, other chairs in the Majestic series such as the Monarch and Regis, come with complementary nailhead and tassle additions for an extra design flair. 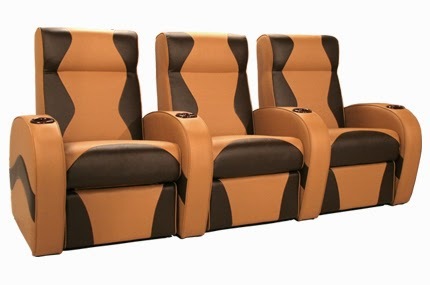 As you can see, 4seating is pleased to offer Seatcraft's latest tour-de-force line of home theater seats. We are so sure of the exceptionally high standards of craftsmanship, that each chair comes backed by a ten-year warranty for the ultimate in customer satisfaction. With the Majestic series, you are the designer, and you get to build it your way.